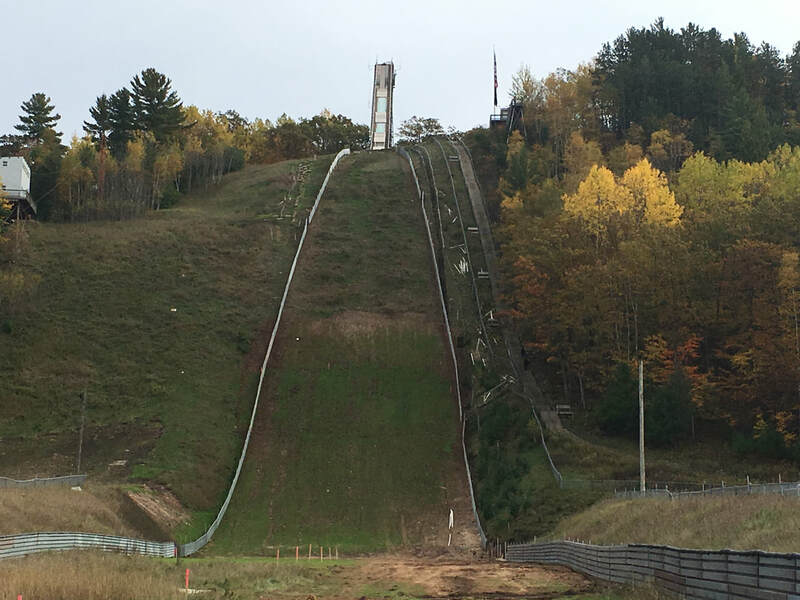 The FIS (International Ski Jumping Federation) has required the Kiwanis Ski Club to complete a number of updates to the ski jump and landing hill. Below are details about the project. FIS Requirements Remaining to be Completed by 2019. 2.From Point P until outrun, find a safer solution for a safer landing area. Complete and Pending FIS Approval. 3.Financing Campaign-Engineering of Phase 2 by 2017. 4.Approve temporary certificate to host COC-February 2018. 5.Distance between inrun guard rails in accordance to the norms. Width equal to 2.50 Meters. 6.Provide for safe stairs with a length of 3 Meters. 7.Construct a new stair tower on the side of the starting stairs. 8.Install a warming room at the top of the stairs. 9.Widen the start gate area in accordance with the norms. 10.Construct an elevator in 2019. 1.Guard rails at in run need to be completed on both sides. 2.Two stairs on both sides of inrun guard rails are required for separation of service workers and athletes. 3.The stroke in E2 must be disposed. 4.Lower level warming area at the existing deck under the start gates is required. 5.The guard rails at hill sources of danger must be disposed of. 6.The end of the guard rails at the knoll must be changed into a solid element without sharp edges. 7.Metal construction under the table must be covered with absorbing mats. 8.Lettering of the start gates must be renewed. 9.Temporary trailers need to be provided for each participating team so each team has a separate facility for athletes-coaches. 1.We have received a proposal for construction costs equal to $2,000,000 for the remaining work to be completed on the Pine Mountain scaffold. 2.This will conclude Phase 3 and complete the requirements of our plan with the International Ski Federation (FIS). 3.The Kiwanis Ski Club is engaged in a Capital Improvement Finance Campaign to raise the required funds and is exploring all opportunities and alternatives.